There was a fox. He was very bad. By chance, he fell into a well. He tried his best to get out of it but in vain. After a while, a goat came there to drink water. As the goat peeped in, he saw a fox into the well. The goat asked the fox what he was doing into the well. The fox was very cunning. He replied at once that he was drinking the sweet water of the well. The goat felt tempted as he was thirsty, but he was frightened as well. The fox could realize the hesitation of the goat. He cleverly told the goat to get down into the well and drink the sweet water of it together. The goat was quite a fool. 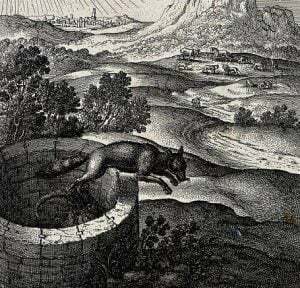 He could not guess the motive of the clever fox and jumped into the well. As soon as he got down into the well, the clever fox jumped off the well putting his legs on the back of the goat. The fox thus freed himself from the danger. He thanked the foolish goat and went away. The goat tried his best to get out of the well. But he could not do so. He became sad for his foolishness.